Loading ramps for your Obsession--Call Northern Supply 800-533-5545. This is a mail order catalog outfit that sells ramp kits. 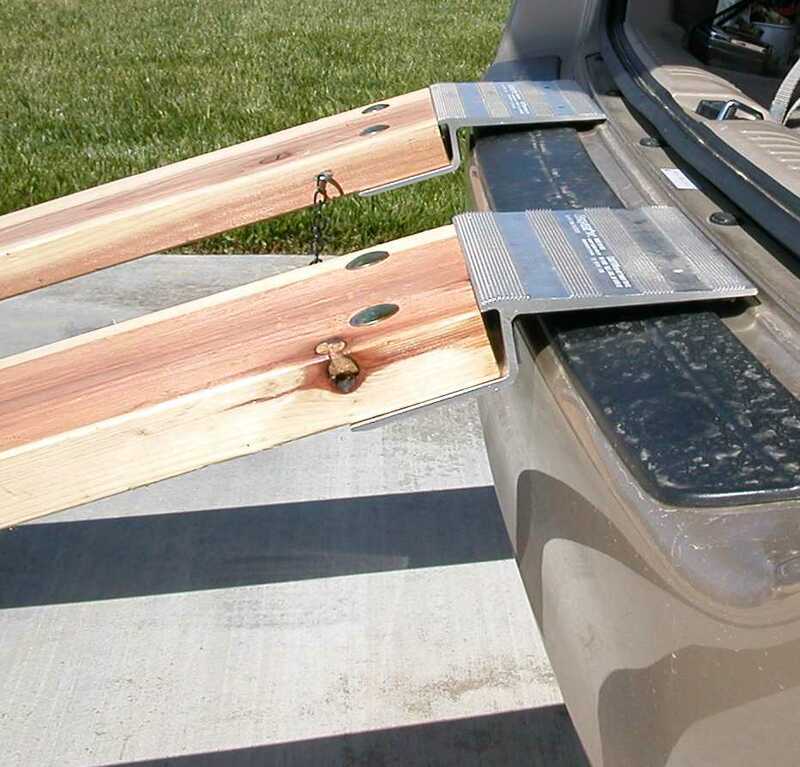 The ramp kits are inexpensive, easily attached to ordinary wood planks, and lap over the loading edge of your trailer or vehicle. They also sell collapsible ramps. Also check out www.ramparts.com, 800-234-6992. I have had a request for more information on the ramps I made, so I have tried to document the design / construction choices I made in the information below. First buy the end kits. Then I would recommend 10 inches of ramp length for each 3 inches of height you are trying to reach. 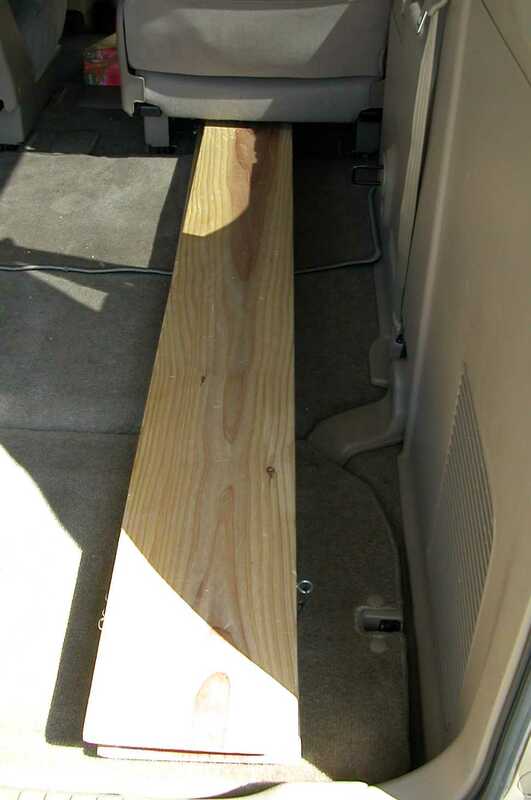 My ramps are 72 inches long (finished size) to to allow easy loading of my mirror box up into my Honda Accord minivan with a rear deck height of 21.5"
Foam pad can be seen attached to the back side of the end. This came with the kit and keeps the ramp from slipping off or marking the rear bumper. 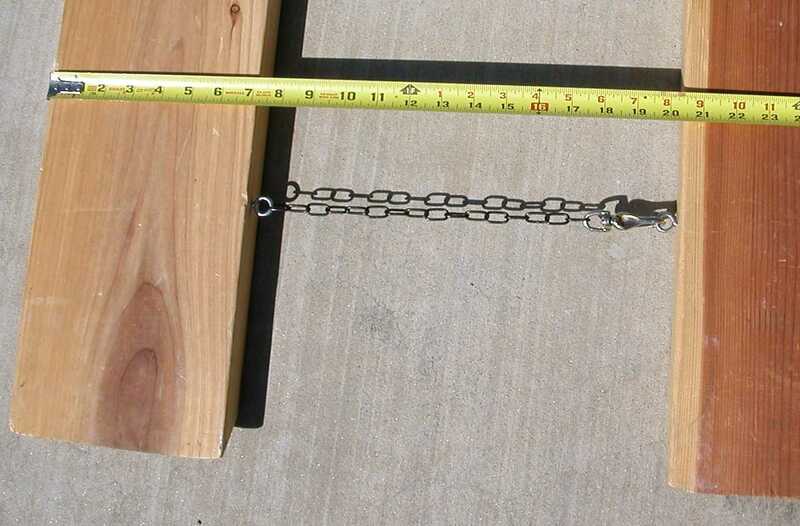 The eyebolts and chain are measured so that when hooked together the ramps maintain spacing to center up the tires on my wheelbarrow tires. 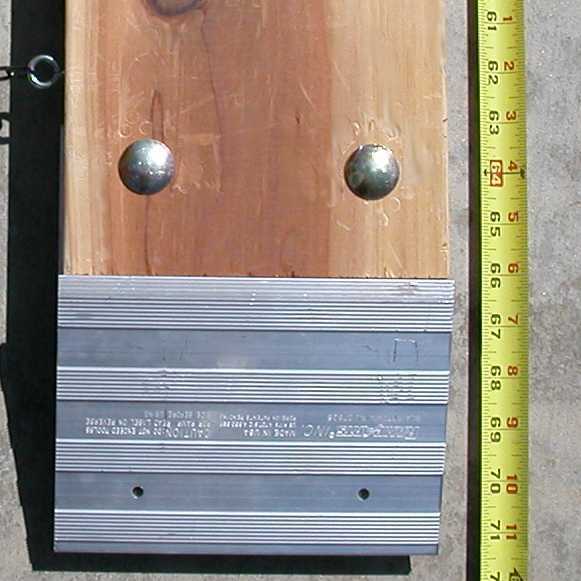 I chose to buy some 2x8" redwood boards that I sanded and finished prior to drilling the bolt holes for the ramp ends. It has resulted in a fine pair of ramps. A bit of overkill for a pair of ramps, but they look real nice and are extremely functional. My friend Terry suggested that I link the upper ends together and lower ends together on the ramps to keep a fixed distance between the boards even when they are bumped during the loading process. This idea has already saved me from dumping my scope twice. I attached eyebolts and a length of chain with a clip fastener at one end so I could easily hook the ramps together and disconnect them afterwards. The ramps positioned for telescope loading. Notice the two chains hooking the ramps together to prevent spreading at 4 in the morning when you are loading up. The bottom chain is a tripping hazard the first couple times you load, but you get used to it real quick and I figure that it's worth it to keep an expensive mirror from making a really bad noise on the pavement one night! Side view. 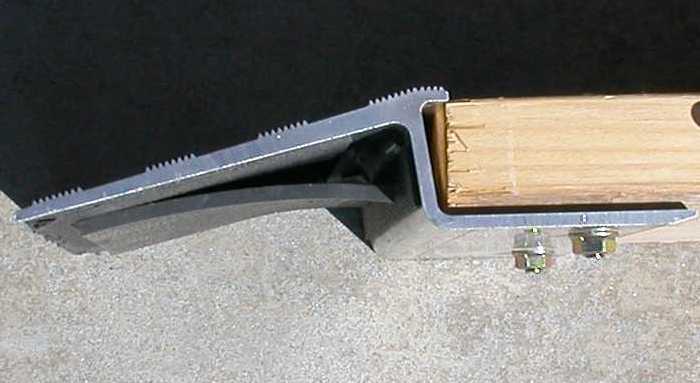 Note the mitre cut at the bottom of the ramps. While it isn't perfectly flush with the ground, I've found that a 45 degree cut is very durable, and the wheelbarrow tires roll smoothly over it. Right click and "View Image" for larger views of all of these images. Close up of ramp / vehicle bumper interface. 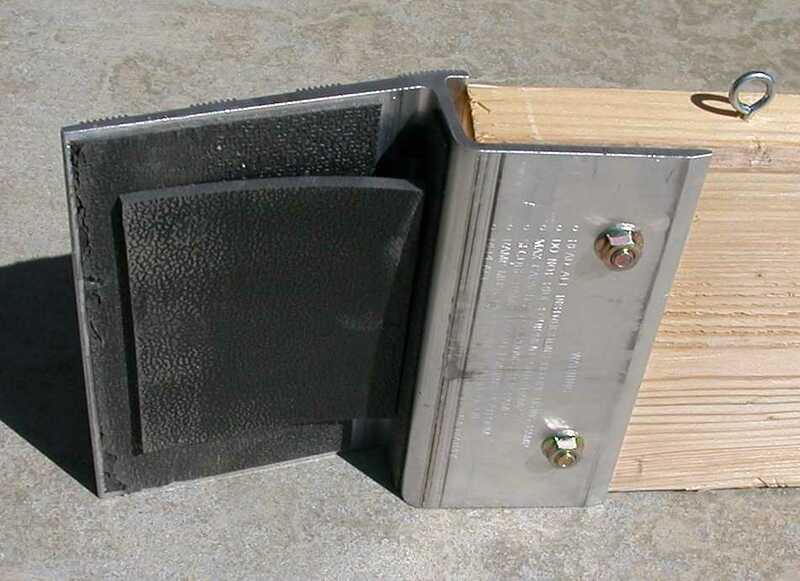 The wheelbarrow tires also roll very easily over the rubber door seal in the upper right hand portion of the image. 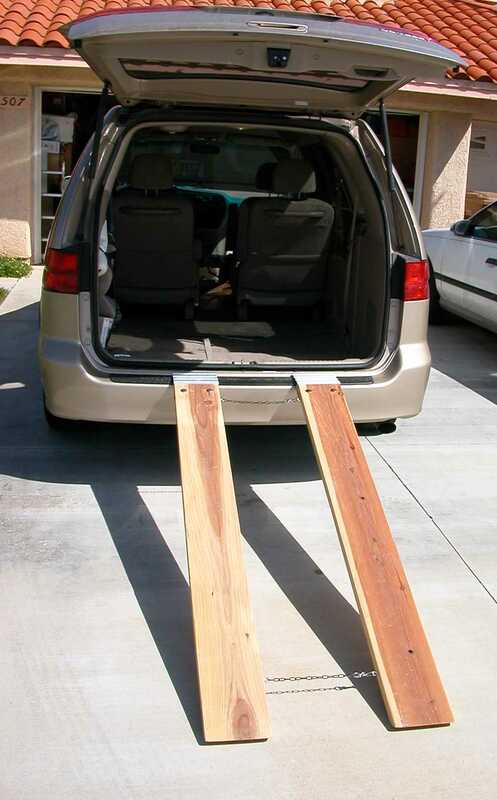 The ramps fit inside the van under the rear passenger side seat either stacked on top of each other or side by side. 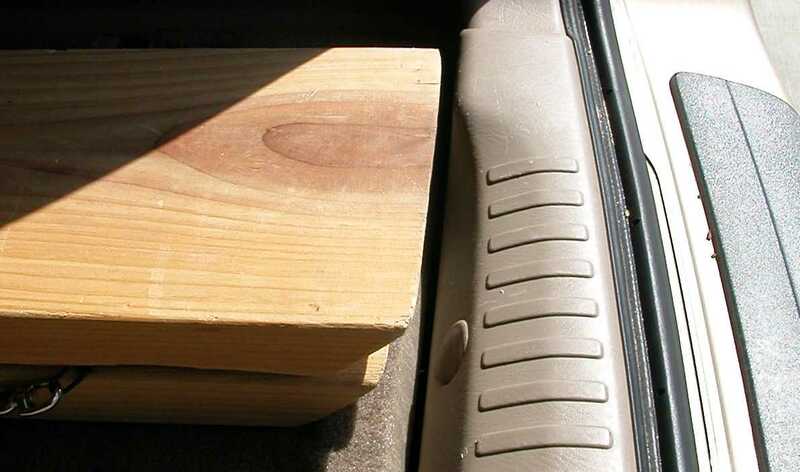 Their length allows them to allow the rear door to be closed without hitting a handle on the right side of the door. I measured this distance before I made the ramps.